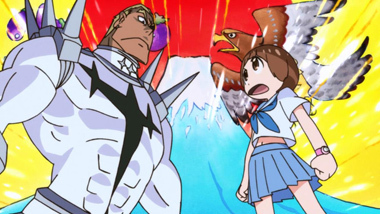 This review assumes you have seen all of Kill la Kill. Spoilers beware! 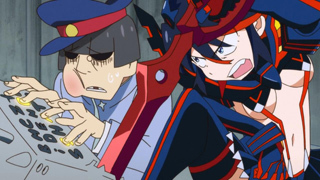 Since we already know what happens in the end of Kill la Kill, the stakes are lessened quite a bit here. Instead, we're initally given a chance to breathe and catch up with everyone. What are they going to do after school anyway (given that they just spent their entire academic life fighting off an evil yarn-based alien race)? Don't expect any groundbreaking plotlines to come to the fore here, we're present just for the fanservice. 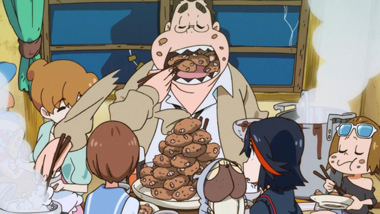 Since the series finale, Ryuko has been living happily with Mako Mankanshoku and her family. Her sister, Satsuki, has been having a less-stellar time. 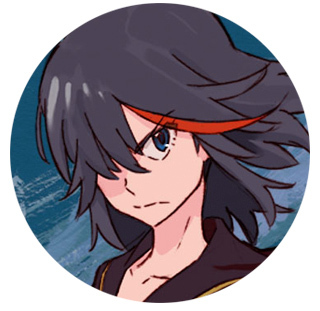 All she knows is the constant struggle against her mother, Ragyo, so now that things are over, she's left restless. The graduation ceremony is her way of moving on -- until it, of course, is interrupted by Rei (Ragyo's assistant) and a pile of Elite Four imitations. 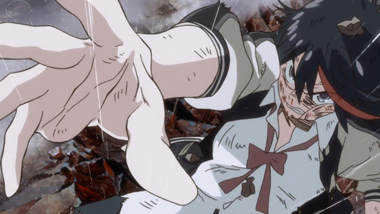 What follows is the typical "conquer your dark selves" plotline, illuminated by Mako's hallelujah-backed interruption. No surprises there! The rest of the episode plays out fairly predictably; and if you've been thinking to yourself throughout the series that the school looks a lot like a school uniform, I have good news for you: it all pays off, finally. Maybe in the most obvious way, but it works, and is something that could've been great as a plot point in the main series. The overall plot works well enough for a standalone episode, but viewer beware: if you were coming back in hopes of seeing certain pairings or dangling story threads (no pun intended) wrapped up, you might be left wanting. If you want more silly action and gooft faces, then this delivers in spades. Perhaps the most interesting segment of the episode for plot-loving viewers is the short flashback to Rei's origins. White savior complex aside, seeing Ragyo in casual military gear and huge aviator glasses trekking across Africa like an 80s action hero is more engaging than recolored clones. There appears to be a much more interesting character lurking beneath the surface for Rei; if only we had gotten to see more of it in the series proper. 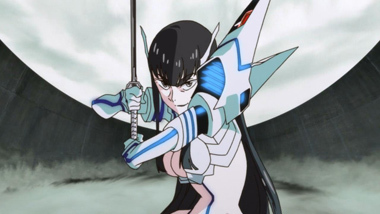 The animation abides by previous Kill la Kill standards: mostly solid work, peppered by reused transformation animations (and one or two other small moments). As with the main series, the storyboarding and key frames range from great to fantastic, only held back by the limited frames per second. That limit isn't felt often, as the artists' keyframes do the heavy lifting. Taken as a piece of the series, this episode does a solid job. It's not meant to stand on its own, obviously, it's simply a small dessert once you've finished the main course. 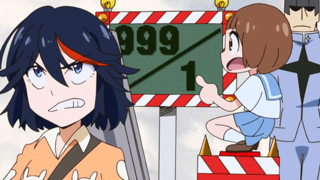 The over-the-top ending and corny backstory tidbits are what make this enjoyable, especially if you need even more Kill la Kill in your life after the first 24 episodes. 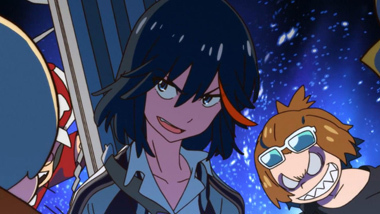 In the end, Kill la Kill 25 is nothing ground-breaking, but is still plenty enjoyable, and will function just perfectly as the cherry on top. 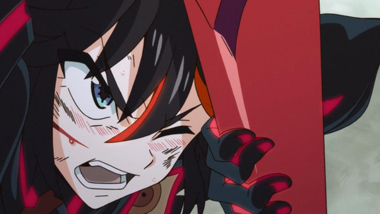 It's pretty rare that a brand-new studio's first project is so hotly anticipated, but this studio is made up of ex-Gainax folks, and the director and lead character designer worked together on Gurren Lagann. 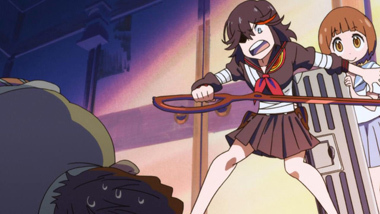 With a dedicated fan-base waiting for something to come and pound them in the head, it's a good bet that this new series, Kill La Kill, is exactly what they were waiting for. If you're hoping for a deep, meaningful plot, I suggest you look elsewhere. 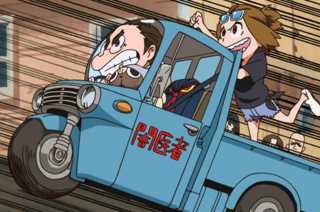 Kill la Kill is a little over the top. No, let me correct that, it's way, way, waaaaaay over the top. Like; if this were a cup of soda, it would be bubbling over the rim of the glass, pouring over the edge of the table and starting to flood the floor of your kitchen. They haven't simply ratcheted the action up to eleven, no, they've gone and pushed into full fledged insanity cranked up to twelve. And this is both the strength and weakness of the series. Harking back to the old-skool days of both Project A-ko and Dragonball Z, the action sequences are fight-tabulous and loaded with extra exaggeration that reminds you that you're watching a cartoon. A powerful character will for example, be introduced as incredibly oversized, mutant-like sorta' Fist of the North Star-ish, other heads will pop, other characters will wilt, and everyone's jaws quite literally hit the floor with maws agape. Plus, their name will be shown in BIG BOLD characters, filling the screen. Every! Single! Line! is delivered with confidence and bravado, making you wonder if the script director's caps-lock key was stuck in the "on" position. And while it's very, very entertaining, you can also quite quickly get tired of the exaggeration, because the series doesn't slow down to take a breath. The non-stop, over the top insanity makes you feel like you're a member of the madhouse, and you're never going to get out. 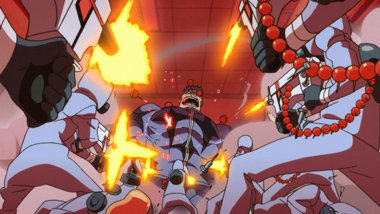 Of course, there's a contingent of anime fans frothing at the mouth for EXACTLY this kind of non-stop action, so, the producers aren't exactly throwing things at a wall to see what sticks, they've already proven with Gurren Lagann that the essential elements of the series already has a fan-base. 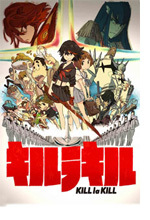 The story is set in a dystopian, post-apocalyptic future high school that student council president Satsuki Kiryuuin dominates by force. She and her gang wear (magical?) "Goku Uniforms" which enhance their strength and speed, giving them superhuman abilities. 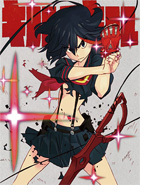 When mysterious transfer student Ryuuko Matoi enters the story, essentially all hell breaks loose. 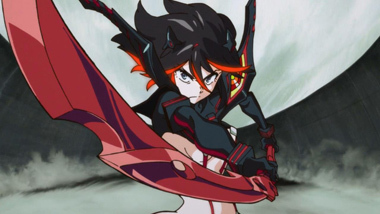 Ryuuko wields a giant half-pair of scissors she uses like a sword and is searching for the mysterious figure who caused her father's death, but confronting her are the student council's "four divine kings." Initially she's no match for the overwhelming power of the student council and their Goku Uniforms. 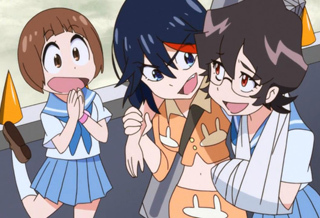 Fortunately, Ryuuko is aided by another teacher who introduces her to a sentient, talking sailor uniform who tells her, "Wear me. When I am worn by you, this power will become manifest." And then it forces itself upon her. 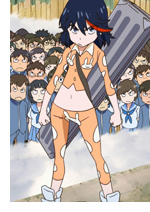 Now unfortunately, because this is anime; her "sailor suit" is even less than a bikini. To call it armor is a misnomer. Hell, to call it clothing at all is a misnomer. It's fanservice cranked up to thirteen. Now there's a lot of fun stuff going on in this series, and it's going to be a single-framer's bonanza finding in-jokes and other random items in among the action sequences. There might even be some surprises in store for those of you who can piece together the threads (literally) of what's going on. 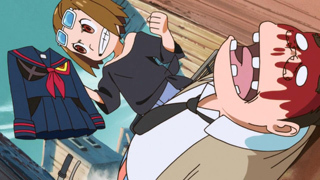 Basically, if you like turning off your brain and turning on the awesome-sauce, Kill-la-kill has everything you're looking for in an anime series: It's got incredible action on a level that's never even been attempted before, as well as fanservice that just won't quit. And the fanservice outfit is what's giving our protagonist the superpowers she needs to defeat her enemies. I mean really, can it get any better than this? Considering the source of this insanity, I'd have to say that YES, it can get better, just in the next episode! 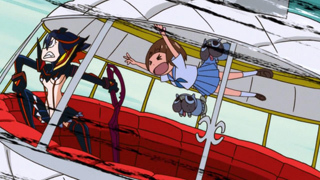 Below: Scenes from Kill La Kill.